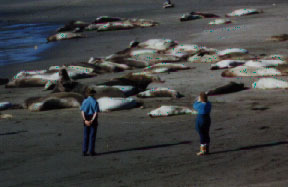 It's a little hard to spot a bull elephant seal, but it's easy to hear them. They like to float just off the beach, and you might never notice them - backlit, looking like the rocks protruding from the sea around them - until one raises his snout and roars. Rocks don't sound like that. The snout, clearly a mad scientist's experiment, mates a pig nose with an elephant trunk: too big for the one, too small for the other. Dark gray, floppy, with giant nostrils, when erect it fires off a sound like a giant drain unclogging or a garbage disposal that snagged the peach pit from hell. Tsok-tsok-tsok-tsok-tsok. The bulls - languid, fat, glistening - seem proud of their noise. If I were an elephant seal I'd be proud merely to be alive, as my ancestors had been hunted almost to extinction, mainly for their oil. Machine parts worked especially well in that lubricant. Hunters once extracted 200 gallons from a fully rendered bull. Today the northern elephant seal is protected, and its numbers are booming to match the bulls' nasal call. In recent years they've returned to haunts long abandoned, and during late fall may be found - among other places along western North America - on sandy coves tucked away along the coast just north of San Simeon, California. To get there you drive northwest, past San Luis Obisbo, Morro Bay and Cambria, and park at a Vista Point parking lot along State Highway 1. You stand near the edge of a coastal plain. On your left, dramatic, rocky cliffs meet the royal-blue Pacific. To your right, a scattering of cattle graze upon the grassy plain, while two miles east, atop a low range of forested mountains, the white spires of Heart Castle hold court beneath a gloriously blue sky. The scenery is so gorgeous you want to cry. A seven-minute march along the low cliffs brings you to the breeding grounds. On a busy weekend you'll be accompanied by dozens of humans of all ages. As you approach the rookeries, your nose picks out the zoo-like stench of an alien species. In the water float those weird, blubbery noise barges as they keep watch over their harems. 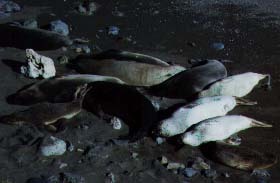 And then you see the flock: hundreds of seals, fat and shiny, the females about six feet long, the juveniles shorter, lying close together by the dozen, asleep. They're longer and fatter than the sea lions we know from the circus, and look like giant beached sardines. But they're mammals, and in the water they can dive a mile deep while snacking on squid and fish. Most snooze in an indolent, sun-warmed stupor, but every so often one will scrape moist sand onto its own back with its front flippers. (Pinniped sunscreen?) About once a second, somewhere in the pod, a seal - face encrusted with sand and flies - erupts in a sneeze; the sound suggests a sports fan offering a raspberry at a football game. Now and then one of the sunbathers idly scratches its nose with a flipper, or rubs the back of one flipper with the tip of the other. The flippers look and move like long-fingered hands wrapped in a dark membrane, and you can see how these amphibious creatures descend from land animals. A couple of young bulls face each other, chest to chest, heads reared back, testing; they nip each other lightly on the neck. One retreats, pushing itself backward a few feet in an awkward slide toward the water, and presently the mock battle begins again. (No doubt these little skirmishes become ferocious as mating season nears: even the young bulls wear scars.) From time to time a seal raises itself up, slithers down to the water, and slides in. Everything here is languid. Except for the humans: they walk right up to the beasts - despite the printed signage warning them not to irritate these predators - and click photos, or point out things of interest to their small children. Some people, toddlers in hand, stroll between the resting herd and the water. I can imagine the seals, somehow alarmed, slithering en masse toward the surf's safety and trampling the people. I wonder how often a tourist is bitten by a seal. Perhaps it is the arrogance of the top predator that makes us incautious. But in some way this, too, is nature at work, one species observing another. I certainly won't shout any warnings, for I'm also standing within feet of the creatures. I take no senseless chances, and I have my escape route planned. On the other hand, angry elephant seals are known to move with alacrity, so I'll be discreet and not test them. Aside from humans, the seals have only two enemies: killer whales and great white sharks. These can disable a seal by biting off its rear flippers or taking a chunk out of its hide. A wounded seal can sometimes save itself by diving to great depth, where the immense water pressure acts as a compress. There must have been a time, not long ago, when seals with bullets in them made crash dives and lived. Perhaps these beached wonders of lassitude are in fact descended from those scrappiest of the endangered. The seals from time to time will open their large, black eyes and stare at you for a moment, as if casing you, and you get the charming, almost thrilling feeling that there are intelligent beings of a different order who share the planet with you, quite aside from the wise guy who cuts you off in traffic on the way back down the coast, or the dodos who let their own offspring kick sand - with their cute little tennis shoes - onto sleeping carnivores. CHECK OUT THE ELEPHANT SEAL FAN SITE! ...AND FELLOW AMATEUR NATURALISTS SPEAK OUT!